As a world traveler living in Croatia, there is nothing that excites me more than finding out where I can go to next. Zagreb’s fairly new airport has already made me feel like I am living in a more international destination, but Turkish Airlines allows me to connect. With direct flights to Istanbul you can then literally travel anywhere in the world. On my recent trip back to the states, I extended my layover in Istanbul to explore this magnificent city that is just 2 hours from Zagreb. The comfort and service was more than I expected and I even got to tune into my own TV shows that were on the inflight entertainment along with hundreds of movies. With local cuisine and Turkish wine to enjoy on this short flight, I was fueled and ready to enjoy my time in Istanbul. The moment you step off of the plane, you realize you are not in Croatia anymore. As the call to prayer begins, at one point you are unaware of where it is coming from. Coming from all directions at different pitches and volumes, the smells of spices, traffic and fish from the Bosphorus also fill the air. Within hours you realize you have arrived to a vibrant city bustling with people, culture and amazing food. There are not many places in the world where you can go and be in two continents in such a short time. 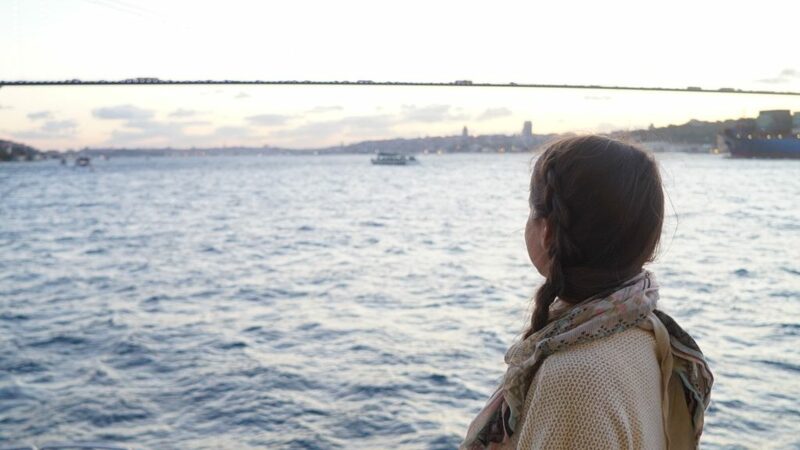 The Bosphorus River flows right through Istanbul separating the east from the west, or Asia from Europe. I’d recommend a cruise down the river to see the contrast in some of the architecture and tempo of life. While traveling, I was told that a large percentage of people live on the Asia side, but work on the Europe side. I spent most of my time on the Europe side as most tourists do and found that even spending 4 full days wasn’t enough time to see everything, so I am already planning my next trip. 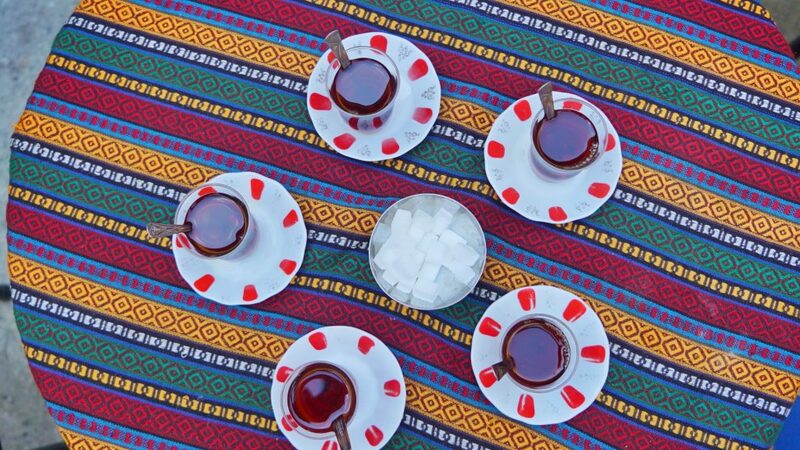 While the city has great public transportation, I always prefer to walk as much as possible The city is full of amazing cafes and eateries along the side streets, where it is always an appropriate time for another cup of black tea or Turkish coffee. The one thing that surprised me the most was the food. I did a walking food tour with Culinary Backstreets, and walking through the backstreets was exactly what you did. Believe it or not, I spent 7 hours on this tour eating the entire time, so you don’t have to worry about being hungry. In fact, pace yourself as some of the dishes you will want to eat the whole thing, but more is always on its way. The tour starts off with a typical Turkish breakfast, of course accompanied with traditional coffee. I learned my lesson the first time around that it is better to wait a few minutes to let the grinds go to the bottom before taking a sip. My favorite part of the breakfast was fresh cheese and honey on a pretzel bagel called simit. We traveled through the spice market to our next stop where we tried Turkish delights from one of the oldest shops. 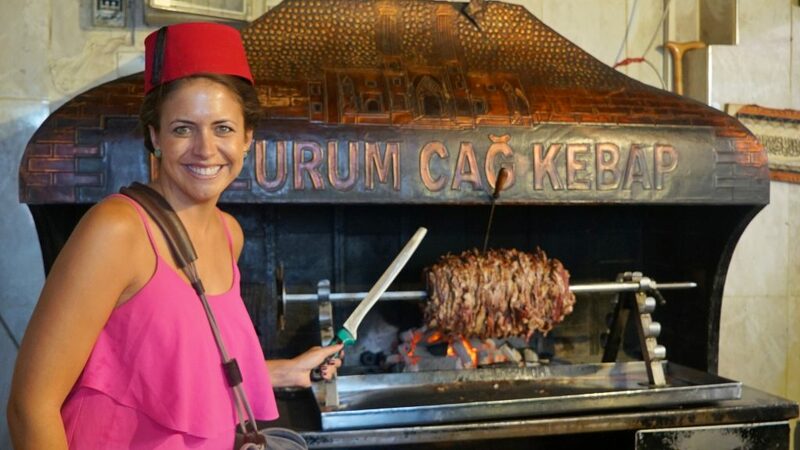 Delighted by these treats, we kept with traditional foods and had the ultimate kebab, a must when visiting Turkey. Our guide was old friends with all the owners which created an amazing atmosphere and allowed me to also connect with the locals. The tour continued with lamb soup, a cheesy dessert that I was drooling over and some of the best “pita” I have ever tasted. We ended at a restaurant full of locals and indulged in lamb with sides of rice, and a tomato mixture that reminded me of salsa, fresh and light. Eating from the streets and having a guide take us through gave me a day to remember and I felt I got to connect with the culture and locals along the way. 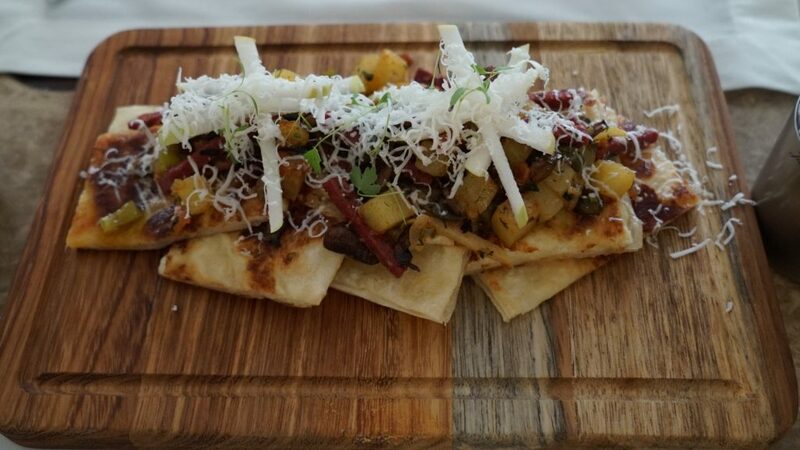 Besides, I find the best memories on any trip usually revolve around food, am I right? 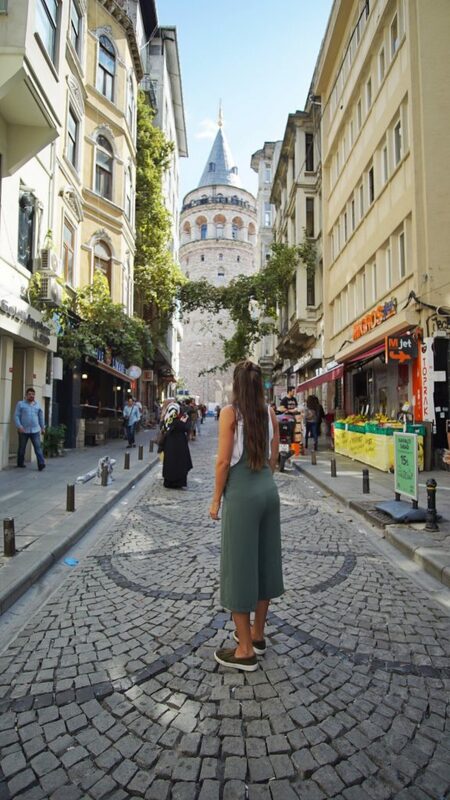 When it comes to Istanbul’s iconic landmarks, you not only walk through history, but you through the rise and fall of many empires. While one site is not necessarily more important than the others, I will share with you the ones I felt couldn’t be missed. 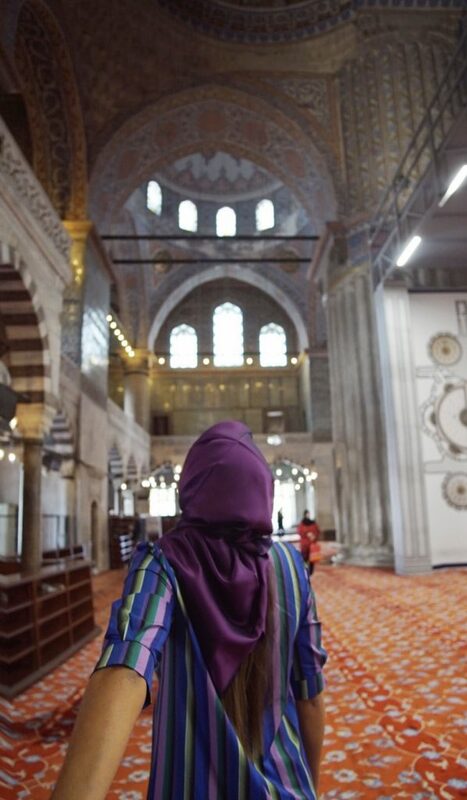 Of course the Sultan Ahmed (often refereed to as the Blue Mosque) and Hagia Sophia are symbols of this thriving city, however I found that walking into less famous mosques allowed you to enjoy the silence and appreciate every detail on the wall rather than dodge the crowds. 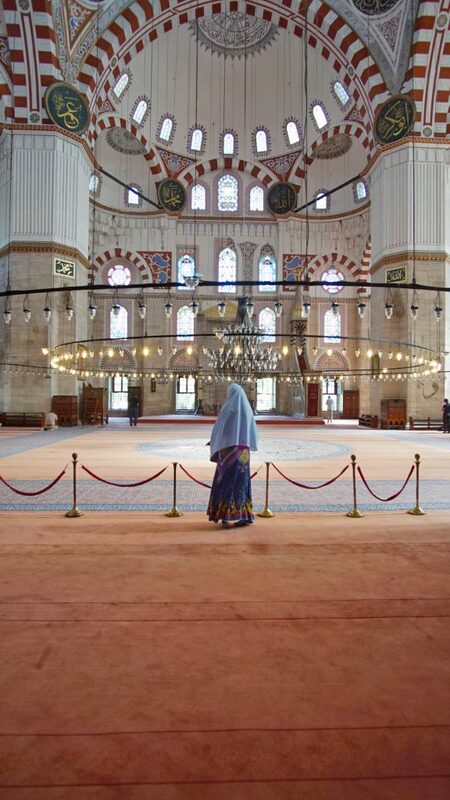 When planning your visit be mindful of the days and times as sometimes mosques are closed for prayer and you always must make sure you are dressed appropriately to enter. Hagia Sophia and Sultan Ahmed are across from one another and nearby you will find the Basilica Cistern. Built during the 6th century, this is the largest of several hundred cisterns that still stand today. Before sunset, stay in the area and find a rooftop bar to admire these magnificent structures from above. With the call to prayer as dusk, this was a moment where I was reminded why I love to travel. Other sites that shouldn’t be missed are Galata Tower, which offers a great view, however go early to avoid a long line for tickets. The Grand Bazaar and Spice Market are worth half a day or even longer if you like to shop. You will find anything and everything with the evil eye on it and colorful scarves, pottery, and souvenirs galore. Just make sure your bartering skills are fine tuned. As a travel journalist I’ll admit I’m not big into museums, but palaces are a different story. Topkapi palace is worth more than a few hours as you can see what life was like for the Sultans during the 15th century. After the 17th century when the palace lost its importance, sultans moved along the Bosphorus and Dolmabahce Palace is also worth a visit. One thing I wanted to try was the traditional hamams that often resemble a mosque. 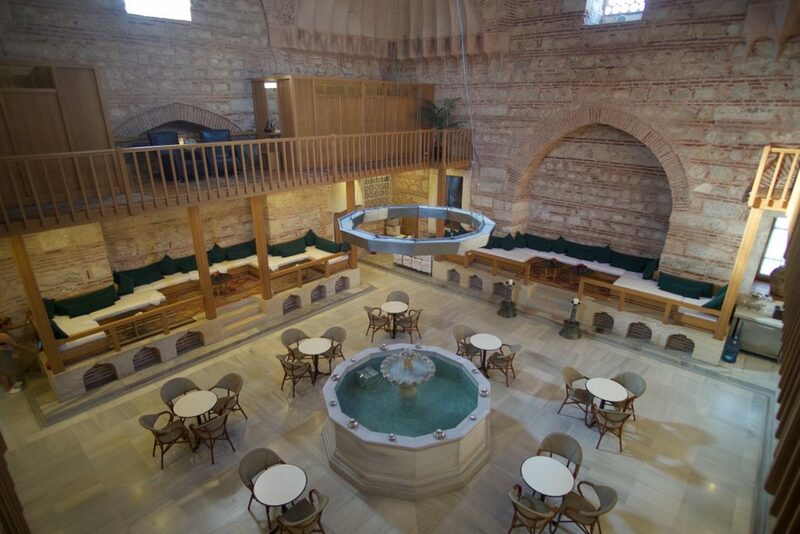 These Turkish baths are typically divided between male and female and while this old tradition was to bathe and be cleaned once a week, today many locals still use it weekly while others enjoy as a tourist. I wanted to experience the ritual and decided to do so at Kilic Ali Pasa Hamami. During the morning hours the bath is open for women and has an amazing café to enjoy a cup of tea before the ritual begins. I was told that the process used to be that mothers would look for wives for their sons at the baths. I can tell you that I have never felt so clean before as they literally scrub off one layer of your skin. The one-hour process consists of being washed with super soapy water, getting scrubbed and relaxing on a hot stone. They also will wash your hair so you are feeling clean from head to toe. Afterwards you are encouraged to rest in the relaxation room, drink some tea and enjoy the beautiful architecture of the building. I was fortunate enough to be there during a bridal ritual. The bride and her friends light a candle and walk around the fountain in the middle of the relaxation room. They then proceeded to dance and move the celebration into the spa where they have a private ceremonial bath with more music, dancing and celebrating the bride. While I wouldn’t say that I am a believer in horoscopes, fortunetellers or tarot cards, I can tell you that it is always going to be a fun experience whether you take it literally or not. 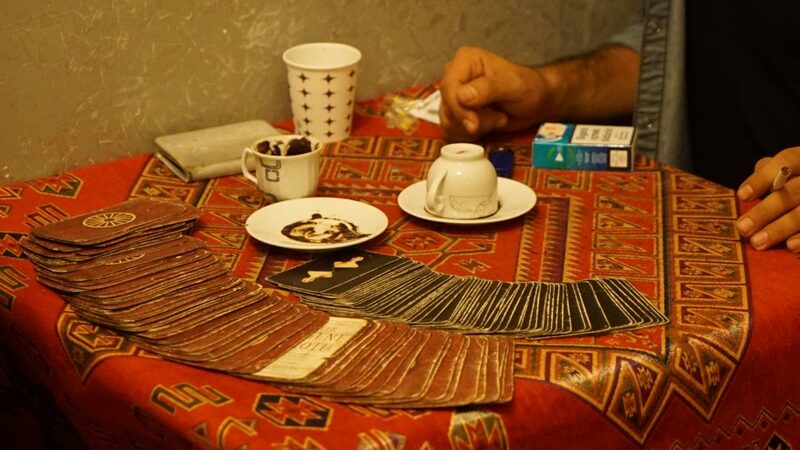 In Istanbul, you will find many cafes that will offer you a fortune teller and they will read the grinds of your coffee. After you drink your coffee, you place the saucer over the top and flip it. The fortuneteller then reads the grinds of the coffee by how they lay against the coffee cup. I was told everything from an ex boyfriend would come back into my life and we would get married to arthritis runs in family. I was also told I would have a career change and work for the government and get paid a lot of money. If any of it comes true, I’ll be sure to let you know. When it comes to accommodation and where to stay in Istanbul, I highly suggest The Stay. With three locations around the city, you really can feel like a local. The Nisantasi location is in the heart of a great shopping district where you can spot locals looking sharp in their high fashion attire. There’s also great access to the metro and wonderful restaurants to enjoy. The hotel itself has comfortable and clean rooms with a great dining and lounge area. The breakfast comes with the room and it one of the best I’ve ever had. 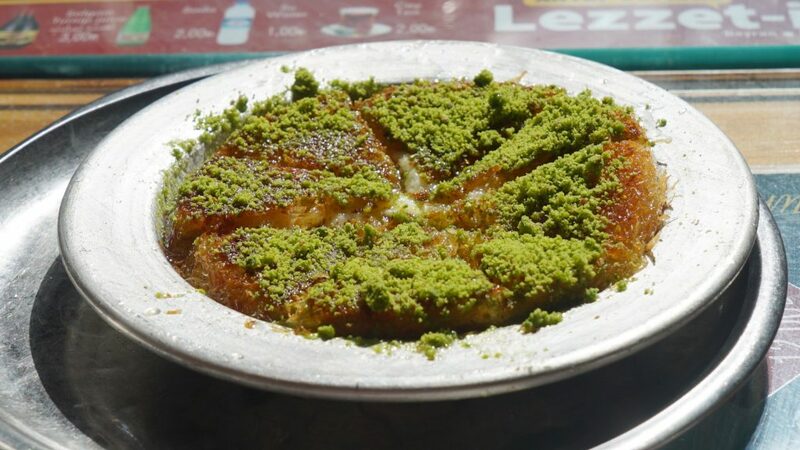 Let the chef prepare you traditional Turkish cuisine and don’t miss out on the fresh squeezed juice. The Stay Late Antiquity location is super local and trendy nestled in between old antique shops and trendy coffee shops. 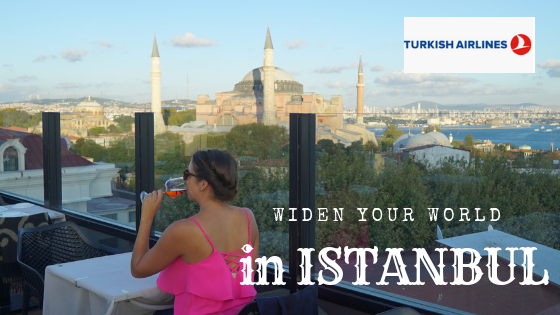 This location you can conveniently access Taksim Square, Galata Tower and best of all, from the dining room you have the most perfect view of the whole city. And finally, the final property has a view of one of the most photographed places in the entire city, the Bosphorus Bridge. Rooms have the most stunning views on the Bosphorus. The river is lined with amazing restaurants and cafes to enjoy local and international delicacies. 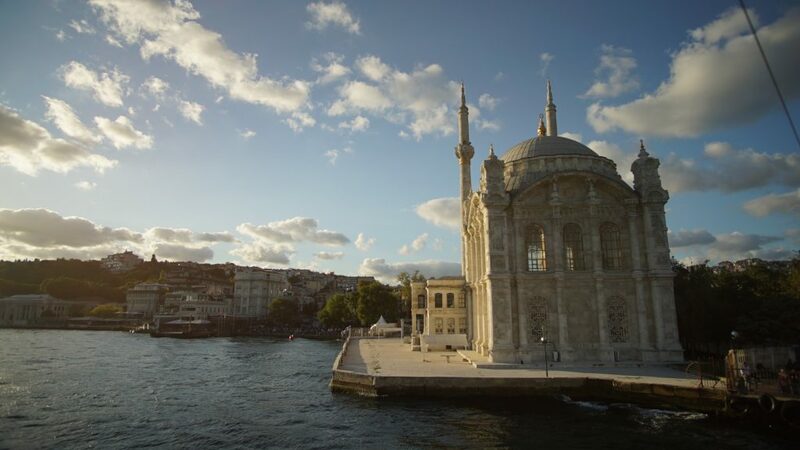 This is also the area you can catch a boat ride down or up the Bosphorus. Istanbul is a magical place that connects the east with the west. Whether you travel to Istanbul to start a tour through the country or you are just passing through on a layover, I found it to be a great connection on my way from Zagreb to Los Angeles. 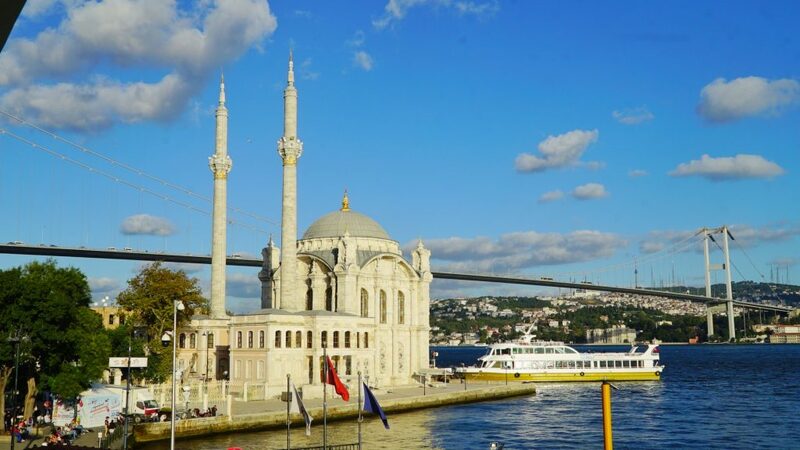 With a stopover program, you can stay for a day and do some sightseeing or extend your trip for several days as you can really access the whole world through Istanbul. This year Istanbul will open a brand new airport, which will make the experience even more worthwhile. Turkish Airlines slogan, Widen your World is exactly what they do and as a traveler, I can say it is a culture that really should be discovered.